Hi there, hello, so glad to be back with you!!! Hope you are all having a ton of fun getting prepped for your big Turkey Days on Thursday... I just love this holiday-not just for the delicious food and the special time with friends & family, but also because it kick-starts the entire holiday season! If you were brave enough to venture out to the grocery store this weekend, you are sure to have already experienced some major hustle & bustle...but just in case you are a bit behind I thought I would share with you a quick & easy printable list of family favorite Thanksgiving Day recipes, along with a printable grocery list and some easy instructions for preparing the perfect Turkey! 1.) Tuck wings underneath body. 2.) Pat turkey dry inside and out. Salt and pepper inside of turkey. 3.) Gently separate skin from turkey breast. Stuff softened butter under skin. 4.) Loosely stuff large cavity of turkey (stuffing will expand as it cooks). 5.) Stuff neck cavity with a small amount of stuffing. Fold neck skin over opening. 6.) Using kitchen twine, cross the legs together and tie them. 7.) Season turkey all over with coarse salt . . . 8.) and freshly ground black pepper. 9.) Put turkey into roasting pan. It's ready to roast. Turkey weight with giblets: 10-13 lb. Cooking time: 1 ½ to 2 ¼ hr. Turkey weight with giblets: 14-23 lb. Cooking time: 2 to 3 hr. Turkey weight with giblets: 24-27 lb. Cooking time: 3 to 3 ¾ hr. Turkey weight with giblets: 28-30 lb. Cooking time: 3 ½ to 4 ½ hr. 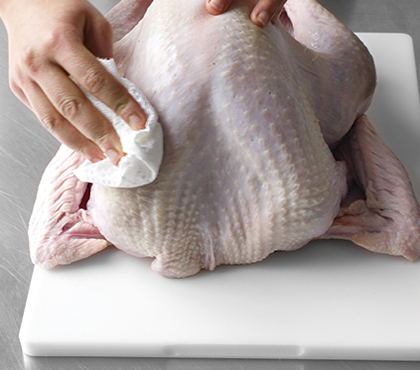 Start with a completely defrosted bird (allow 24 hours in the fridge for every 5 lbs., the safest way to defrost). To measure the internal temperature of the turkey, insert a thermometer through the thickest part of the breast to the bone. Times are for unstuffed birds. A stuffed bird may cook at the same rate as an unstuffed one; however, be prepared to allow 30 to 50 minutes more. While turkeys take about the same time to roast in regular and convection heat, a convection oven does a better job of browning the bird all over. When you remove the turkey legs, if you find that the meat around the thigh joint is still too pink, cut the drumsticks from the thighs and put thighs in a shallow pan in a 450° oven until no longer pink, 10 to 15 minutes. Place the turkey, breast down, on a roasting rack set in a roasting pan and put the reserved neck in the bottom of the pan. If you don't have a roasting pan with a lid, you can cover an aluminum Roast for 45 minutes, basting the turkey every 20 minutes once the pan juices accumulate. After 45 minutes, flip the turkey onto its back and continue to baste and roast for about 2 to 2 1/2 hours. When you remove it from the oven, cover it very loosely with foil, and go about getting your side dishes to the table (or have a glass of wine and delegate). 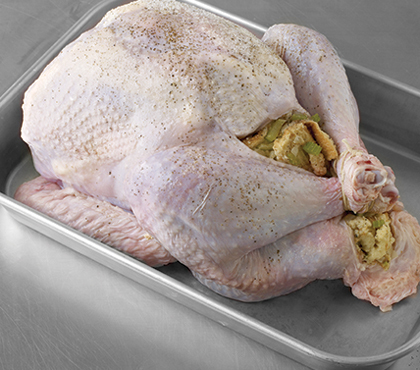 Don't worry, it won't get cold; a covered 20-lb turkey will stay hot for over 40 minutes, so don't rush it. I sure hope this helps take a little stress off of your last-minute dinner planning! Have a great Monday!